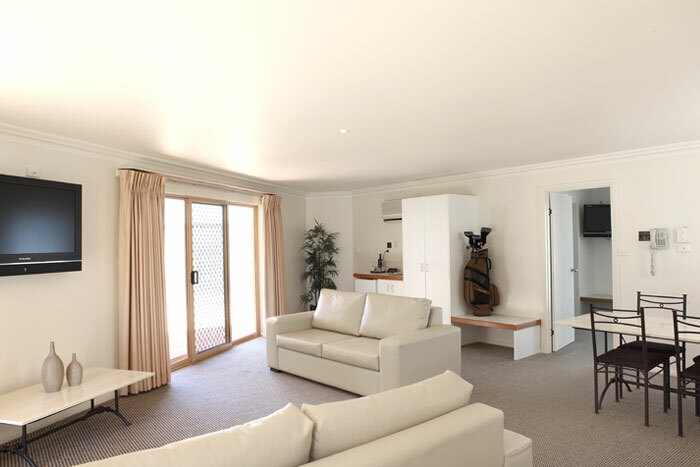 Murray Downs Resort offers you a variety of rooms including self-contained apartments for your next business trip or holiday in Swan Hill. 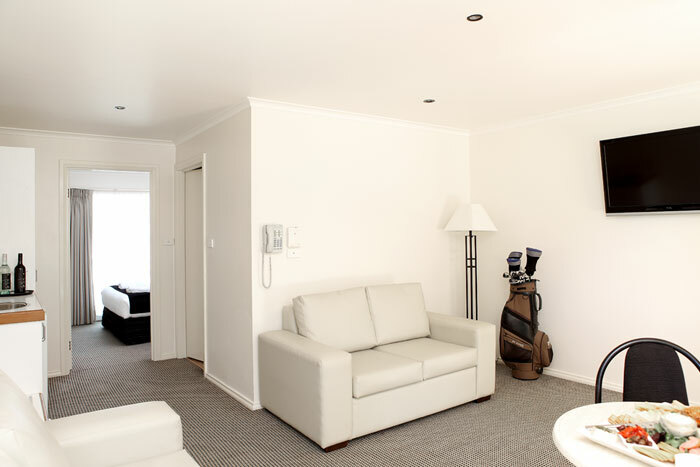 We have an assortment of accommodation types to suit just about every golfers and non-golfers alike need. 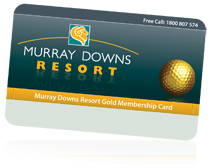 The Accommodation at Murray Downs Golf Resort is perfect for families, couples, groups, corporate and business travellers, self-drive and golf holidays. 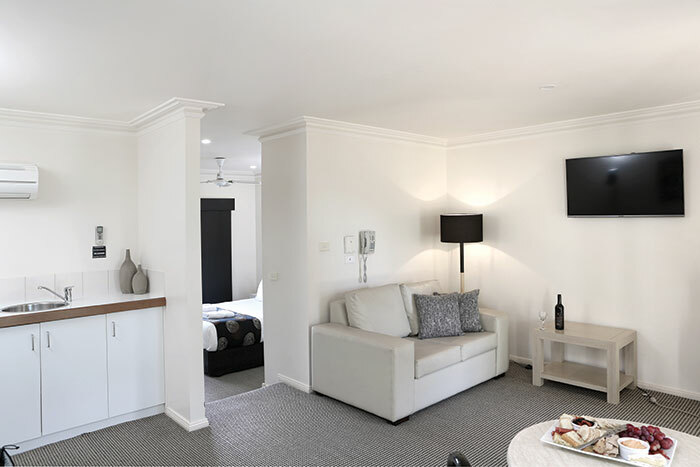 All rooms enjoy complimentary access to resort hotel facilities, such as the solar heated swimming pool, lawn tennis court and complimentary barbecue facilities. 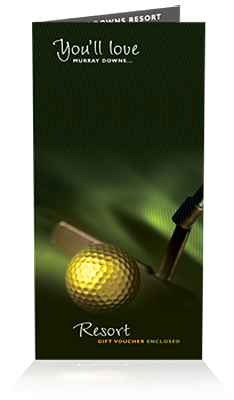 Play the number 1 golf course on the Murray River, take advantage of the golf resorts bistro restaurant, bar, café, complimentary wireless internet access and room service. Check in from 2.00pm, Check out by 10.00am. Modern Spacious Resort Room with 1 Queen Size Bed, 1 Single Size Sofa Bed & Bathroom. 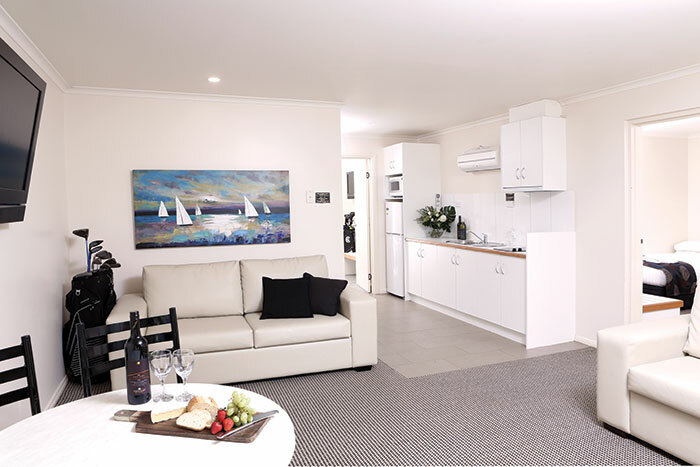 Overnight $145.00 (Double). Modern Spacious Resort Lounge Area, Bedroom & Bathroom. 1 Queen Size Bed, 1 Double Size Sofa, 1 Single Size Sofa. Overnight $160.00 (Double). Modern Spacious Resort Lounge Area, 1 Bedroom & Bathroom. 1 Queen Size Bed, 1 Double Size Sofa, 1 Single Size Sofa. Overnight $160.00 (Double). Modern Spacious Resort Lounge Area, 2 Bedrooms & Bathroom. 2 Queen Size Beds, 1 Single Size Bed, 1 Double Size Sofa, 1 Single Size Sofa. Overnight $199.00 (Triple Adults OR Family). 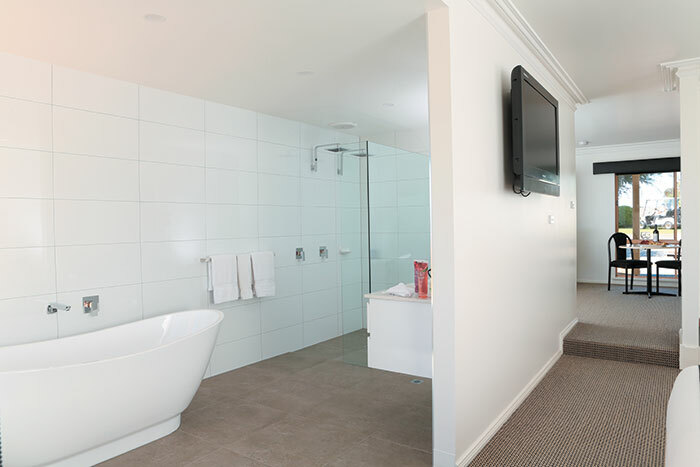 Modern Spacious Resort Lounge Area, Bedroom & Ensuite Bathroom with Corner Spa Bath. 1 Queen Size Bed. Overnight $180.00 (Double). 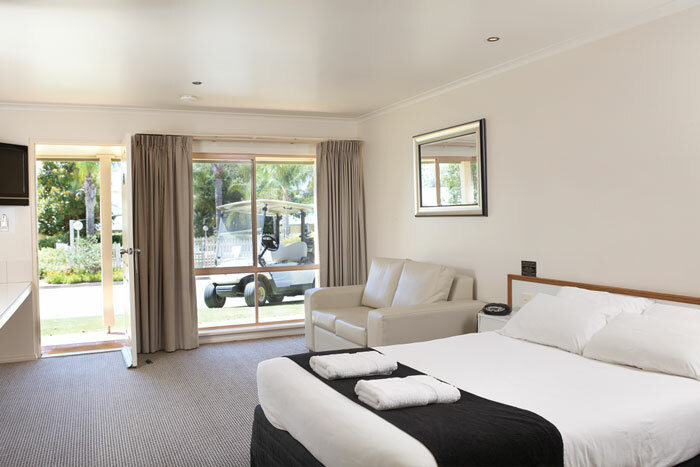 Modern Spacious Resort Lounge Area, Bedroom & Ensuite Bathroom with Bath. 1 Queen Size Bed. Overnight $205.00 (Double). Modern Spacious Resort Lounge Area, Bedroom & Ensuite Bathroom with Corner Spa. 1 Queen Size Bed. Overnight $205.00 (Double). 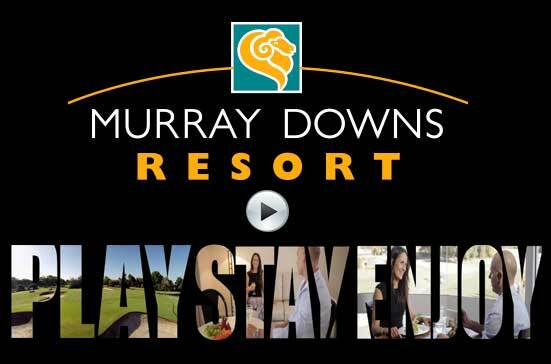 For golf on the Murray and a great experience look no further than the Swan Hill accommodation at Murray Downs Resort.